The big wedding photo trend to Trash the Dress and the lure of the amazing photo opportunity (and the photos are amazing – let’s be honest) has been a thing for more than a decade. 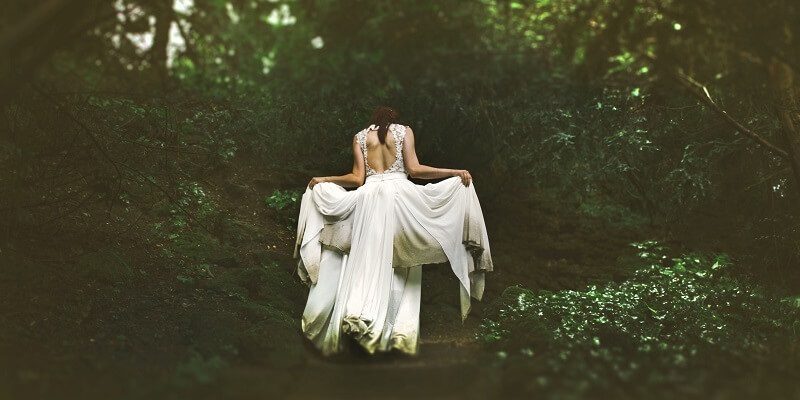 It seems fitting that it was started by a Los Vegas wedding photographer John Michael Cooper, who, when bored with traditional wedding photography, convinced clients to pose in dirty settings, submerge themselves in freezing water, or light themselves on fire, all while wearing their bridal whites. With social media offering the perfect gallery for a few minutes of fame, the trend took off and seems unstoppable. But there is more to ruining your trousseau than a great wedding shot. And that is the real cost to Trash the Dress - beyond the average price of $2,500. Getting a great shot to remember a great day is fair enough, but it's worth thinking about getting a shot that looks amazing, is part of a celebration of good, doesn't completely write off your dress, waste a lot of resources or even endanger your life. The ocean or water shot is by far the most popular and I know what you are thinking. My dress is a literal drop in the ocean. But would you intentionally toss a plastic bottle into the ocean? Sure it’s a literal drop in the ocean but even if you think jumping into the ocean isn’t going to wreck the dress, what are you taking with you into the sea? Hairspray? Fake tan? Whatever is going to fall off that dress by the way of sequins, crystals, microfibers isn’t coming back out when you do. Depending on what your dress is made of, a mud shot might be the best option to Trash the Dress but not completely write it off. If your dress can be successfully cleaned, without being bleached, then you can have your shot and give the dress a life beyond your wedding as well. Really? There's no going back from this one, even if you use a sustainable non toxic paint. 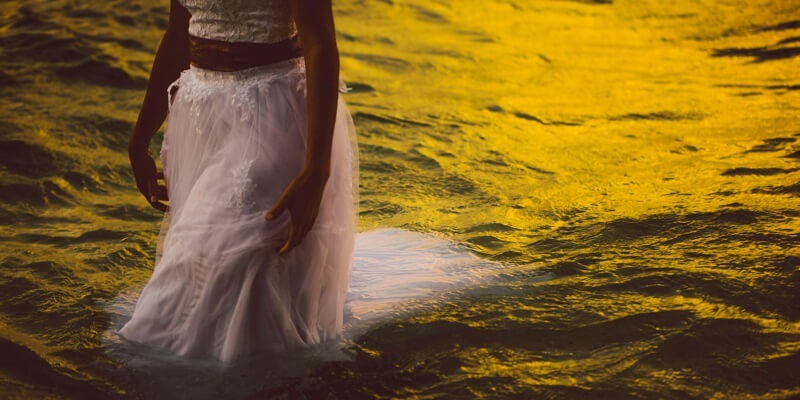 In 2012, A newlywed woman in Rawdon, Canada was in a Trash the Dress wedding photo shoot, standing at the edge of the Ouareau River when her gown became heavy as it soaked up the water. The current pulled her away and she drowned. It's an isolated incidence of course, but does highlight the danger of some of these shoots, especially as amateurs are involved. And then there’s fire. We know that kind of goes without saying, but when we see this incredible image, by photographer Tal Zigdon you might be tempted to try and pull this shot off. The truth is that we found this on the internet and there is a lot of speculation about whether it is real or largely photo-shopped. Whatever it is, it's a good example of just how bizarre things can get. According to DIY Photography, 'Tal Zigdon' took many months trailing and testing the shot before construction. While you'd want to be spending months trialling and testing a shot like this, you'd really have to ask why. These kind of decisions can be the end of a very short marriage and potentially even your life, for the sake of a great shot. In this case, while the photographer seems to have done many wedding shoots, but he doesn't appear to have done any other shots like this one and that begs the question of experience to manage a situation that could easily get out of hand. And that's before you think about those toxic fumes from your dress entering your lungs and the atmosphere before you light up. There's also something kind of creepy about having your wedding dress saved to an ashes urn. Turn your dress into an instant heirloom and keep it in your family for future use. This is how it has been done for decades and harks back to a time when being wasteful just wasn’t an option. If you plan on christening any future offspring, christening dresses can be easily birthed from wedding dresses. Join the Rebride movement and just wear it! Wear your dress ironically for, well, however long it’s going to fit you really. Sell it on any of these marketplaces: Still White, Evermore, Love Me Twice or Upcycled Bride. Recoup some of your costs and keep the second-hand, slow fashion industry alive when fast fashion might see it disappear. Donate it to a worthy cause, such as Angel Gowns, who turn pre-loved weddings dresses into gowns for babies that have been born stillborn or have passed shortly after birth. Donate it to Vinnies, Lifeline or the Salvos. Donate it to a slow fashion designer who will recraft the fabric into pieces that live on. Donate it to an amateur theatre company so it can live out it life on the stage. Stick it in a box and push it up the back of the cupboard. It’s better than ending up in landfill. Someone might have a use for it in the future that you haven’t dreamed up. 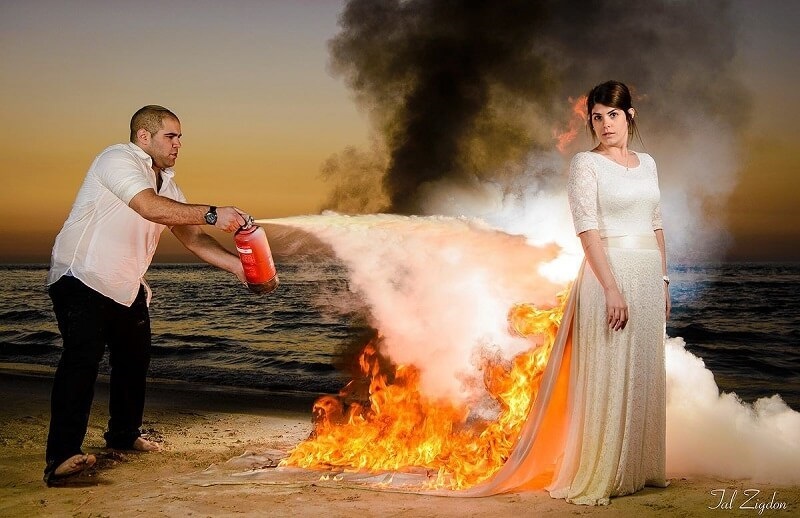 At the end of the day, the Trash the Dress trend is just a photo opportunity. Destroying an object, often coveted by many women, isn’t really a statement about the disproportionately weighty focus on the wedding versus the marriage.